Hat-making: I have always felt like this is such a classic art. I think of old movies and their beautifully tailored outfits, which so often include incredible hats. 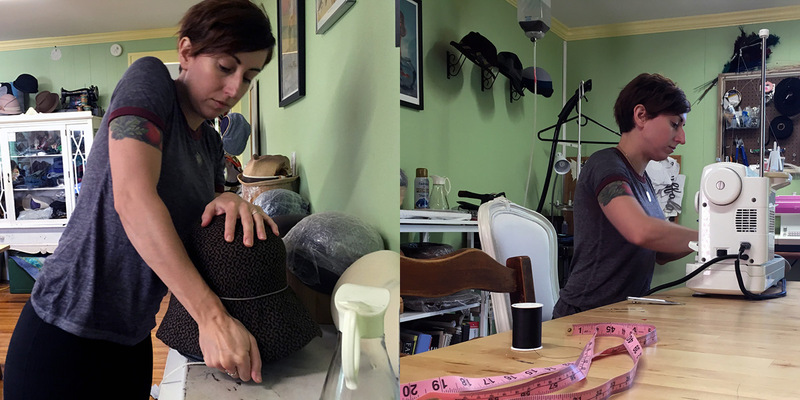 I’m so happy that people like Julie Schworm of Savage Millinery are keeping it beautifully alive. She takes inspiration from these classic looks, but updates them for modern times and adds a lot of her own creativity to each one. I first tell people that I sew things and then sort of break it down from there. 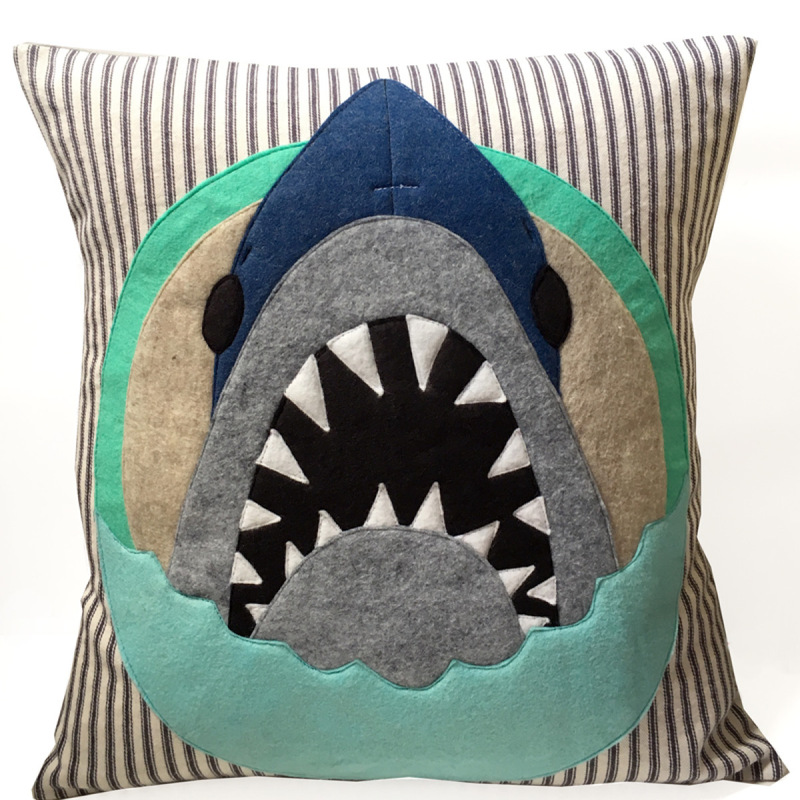 I sew hats, ties, bow ties and have recently started making pillows and bags. 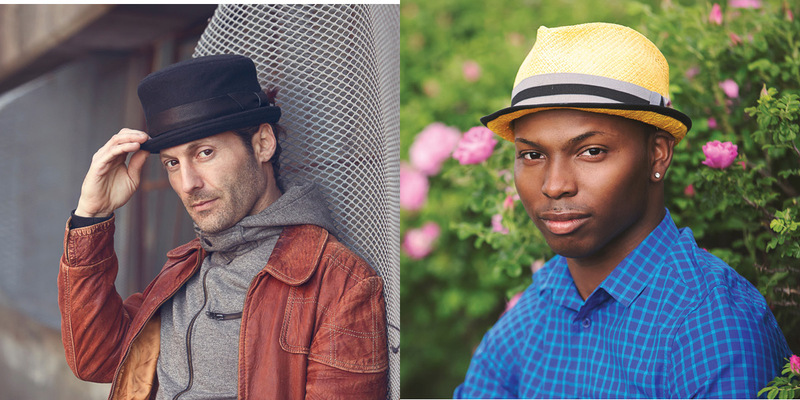 When I tell people I make hats they always want to know what type and the techniques used. I hand block felt and straw using vintage wooden hat blocks and create patterns for my fabric hats (cut and sew). I used to be a graphic designer and I like to use a lot of graphic elements in my work. I also love all things vintage and my work definitely has a nod to other time periods. I create patterns for everything I make and utilize a lot of color blocking, applique and most recently, hand embroidery. I still love to draw -which is what I went to school for -and using applique allows me to use those drawing skills to create designs. It’s something that I can spend hours doing and never get sick of. I think that’s a pretty important factor. If I ever start to hate it I think it would mean I should stop. I don’t foresee that happening though. 3| Describe your style. 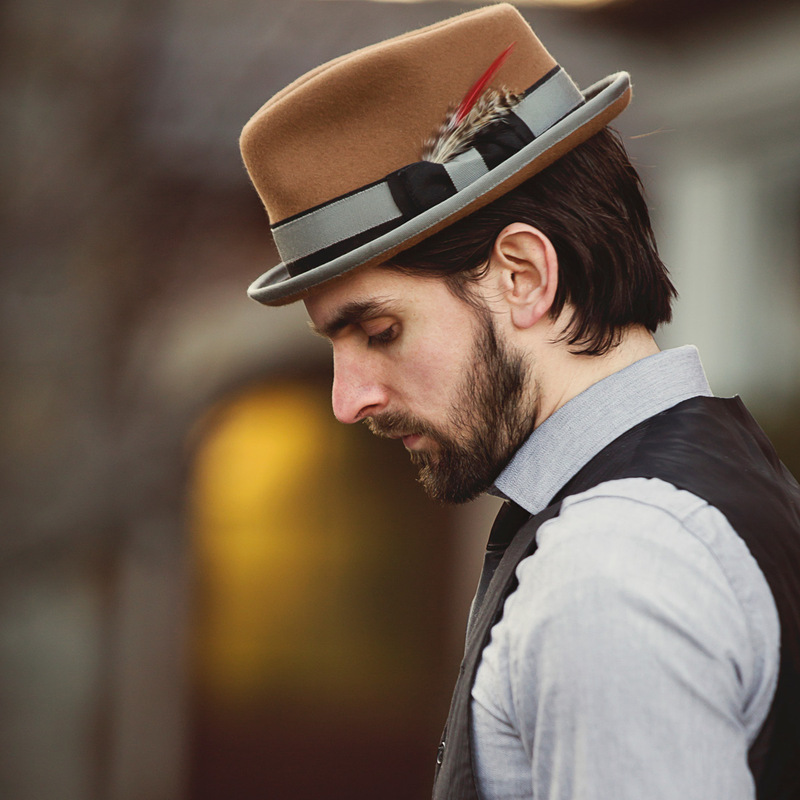 What kind of person wears Savage Millinery? My style definitely draws on vintage and graphic elements. I try to make things that will appeal to someone who doesn’t always have a specific style and I try to keep things new and different without losing my aesthetic. 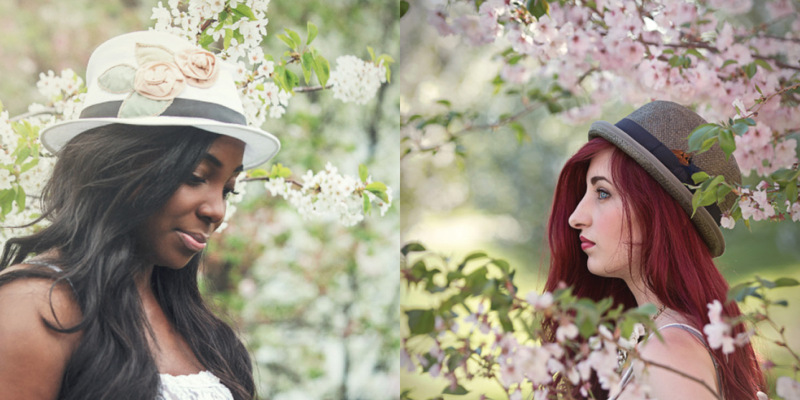 My customers have a love for hats and handmade items and they aren’t afraid to express themselves through fashion. I think whats great is that my customers range in age. I like that my customer varies in age and style. 4| Where do you look for inspiration? I love vintage and I’m always looking at vintage fashion for inspiration. I’m really drawn to retro fabrics and materials. I am a huge fan of art deco and old architecture. Buffalo has some really beautiful old buildings with really lovely details. I find a lot of inspiration in that. I like living in a place that has seasons as well. There is a lot of inspiration in the changing colors that come with the changing seasons. I love that something I make can maybe bring a little bit of happiness to someone else. That maybe they are wearing a hat or tie I made and they love the way it makes them feel. I really like creating things for other people. I don’t think I have ever wanted to not “let go” of something I’ve made. 6| What’s the most challenging aspect of owning your own business? 7| Was being a working artist always your plan or was there an “aha” moment? It was. There were definitely times when I thought about doing something else but I have always had the need to create. I have been sewing since I was 12 and drawing since I could hold a pencil. Making art has always brought so much joy to my life and I feel very lucky to have that ability and be able to share it with others. It can be frustrating at times and not always the most lucrative job but I really couldn’t imagine doing anything else. I think most artists have those days where they just want to throw in the towel but I know I would be pretty lost if I stopped making things. 8| How do you work, and where? I have a studio in my house that I work out of. It has a separate entrance to the second floor. I would eventually love to move into a different space just for a change of scenery and to have a place where I could also hold classes. I try to keep to a normal schedule but I tend to be a bit of a night owl. I could sew until all hours of the night but I try to match my husbands schedule as much as I can. 9| If you could swap lives with another artist, who would that person be? I really admire Natalie Chanin who creates the clothing line Alabma Chanin. She makes really beautiful, detail oriented clothing using a lot of hand sewing techniques. She’s created this amazing artist community and sustainable business. Her dedication to slow design and being a responsible manufacturer is really inspiring. 10| What makes a handmade object valuable? The time and energy an artist puts into their work and the attention to detail that goes into crafting something handmade. The tools and materials the artist uses to perfect their craft. The love that goes into making something handmade is invaluable, I think. It’s not something that is super mass produced but something that was really thought out and made by someone who really enjoys making it. 11| Using that definition, what’s the most valuable object you own? I would have to say my sewing machine is pretty valuable. I wouldn’t be doing what I do without it. I recently upgraded machines and it was a long time coming. Investing in good equipment is pretty essential to making a really good, quality product. 12| Tell us one true thing about yourself that people don’t believe when you tell them. I play roller derby. Most people don’t believe me because of my size and my demeanor. I’m fairly reserved and quiet but I’m also a super competitive person. Joining was one of the best things I’ve ever done. 13| Give us three more non-crafting-related details about you or your life. I have a pet rabbit and a cat. Even though I grew up with dogs I am a rabbit and cat person for life. I lived in Brooklyn for 11 years and Los Angeles for 4. I had so many amazing experiences living in those places and it really helped shape who I am as an artist. I teach sewing in the fashion department at a local college. 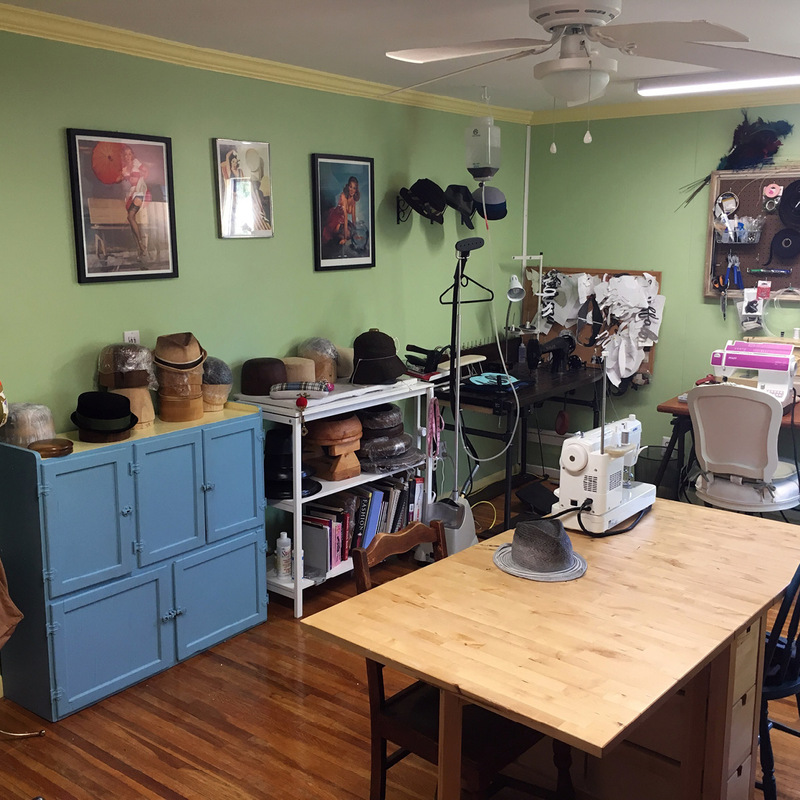 If you want to know more, check out Savage Millinery on Instagram @savagemillinery, Twitter, or Facebook, or see her work in person here at the shop! 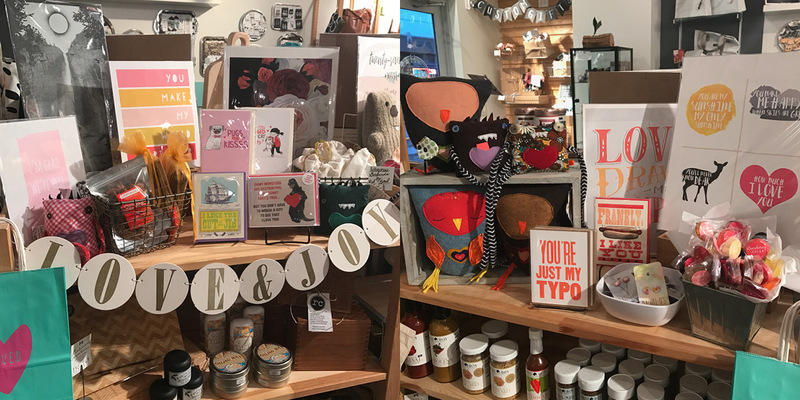 Just a few new fabulous things on our shelves this week, but our Winter/ Spring workshop schedule has officially dropped and it is chuck full of fun things to do during this dreary season. Scroll to the bottom to see the full list, or head on over to our Facebook page to see an event schedule and stay up to date on the latest offerings. 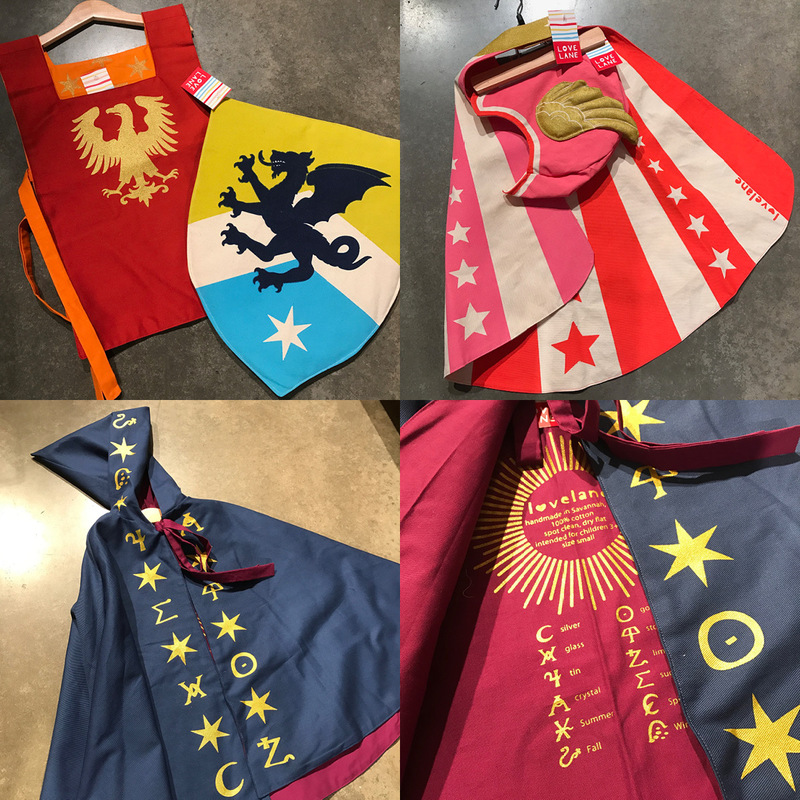 Brand new vendor, Lovelane brings us these INCREDIBLE capes, doublets, shields and hats for creative kids. They are extremely well made and magical! Perfect for all the indoor winter play. 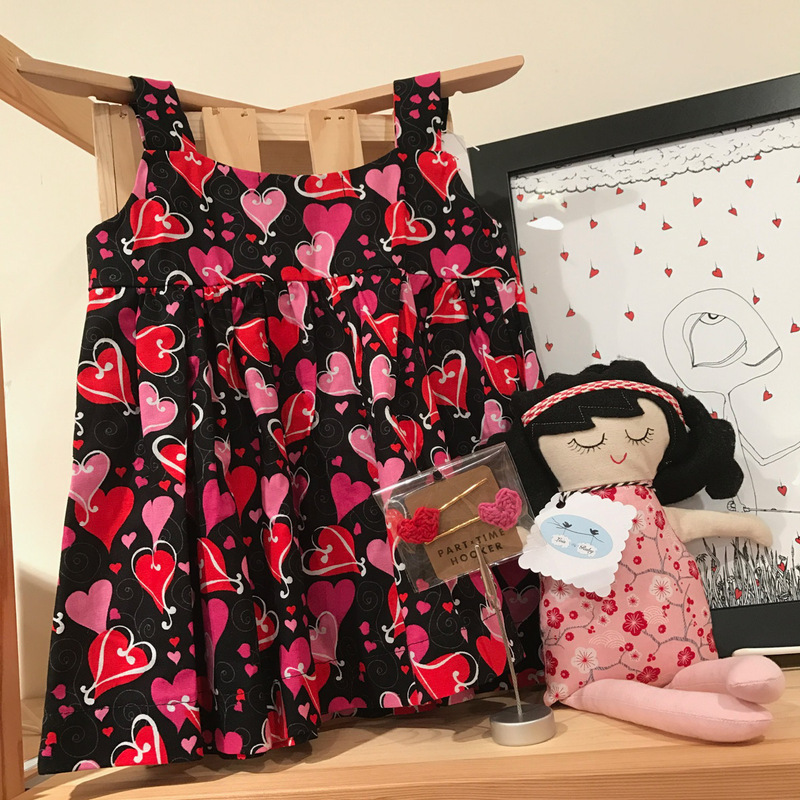 Love this cute Valentine’s display and adorable hearts dress from Donetta’s Designs. 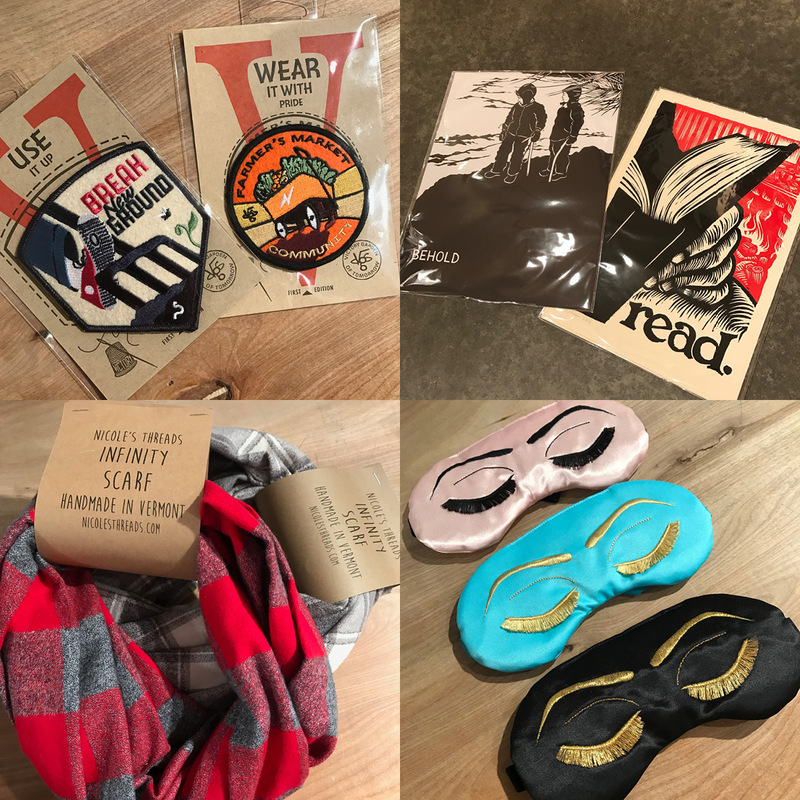 New patches from The Victory Garden of Tomorrow, posters by Nikki McClure, sleep masks by Sleepy Cottage, and restock on these perfect plaid scarves from Nicole’s Threads. 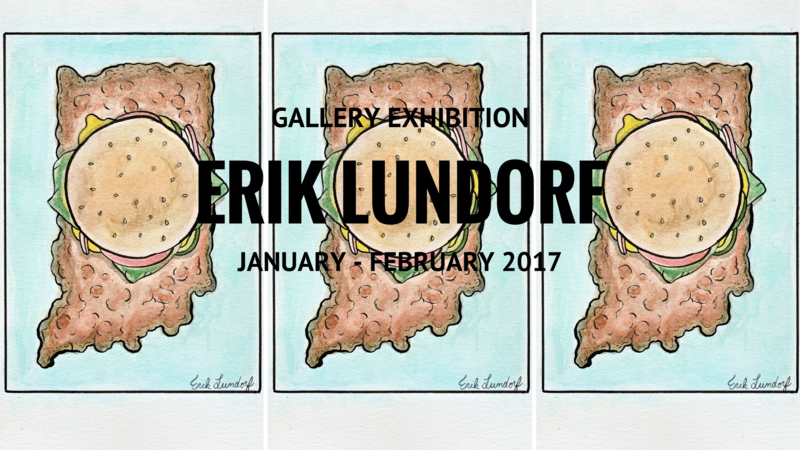 First Friday Gallery Exhibition ft. Erik Lundorf: Friday, February 3rd: 6-9pm: Erik has created a line of Indiana inspired illustrations just for his January – February gallery exhibition in our store. With a Studio Art concentration in oil painting, Erik graduated from DePauw University in Greencastle, IN. He currently works on a wide range of projects from privately comissioned portraits and personal comic strips to commercial illustration and digital design. 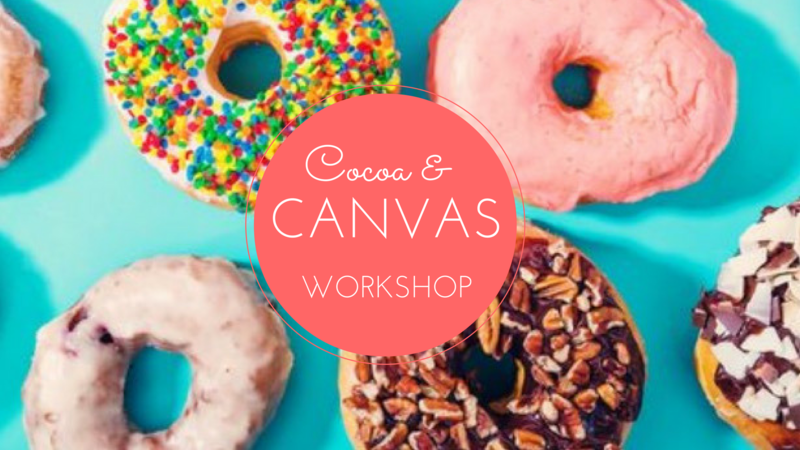 Cocoa & Canvas: Saturday, February 4th: 10:30am-12:30pm: Create a collaborative work of art with your child while warming up with cocoa and donuts! Deanna Leonard from Caravan Classes will instruct on how to paint a Wayne Thiebaud inspired canvas with your choice of donut as inspiration. Partners will learn about color contrast, shading, and light while participating in this fun creative process. 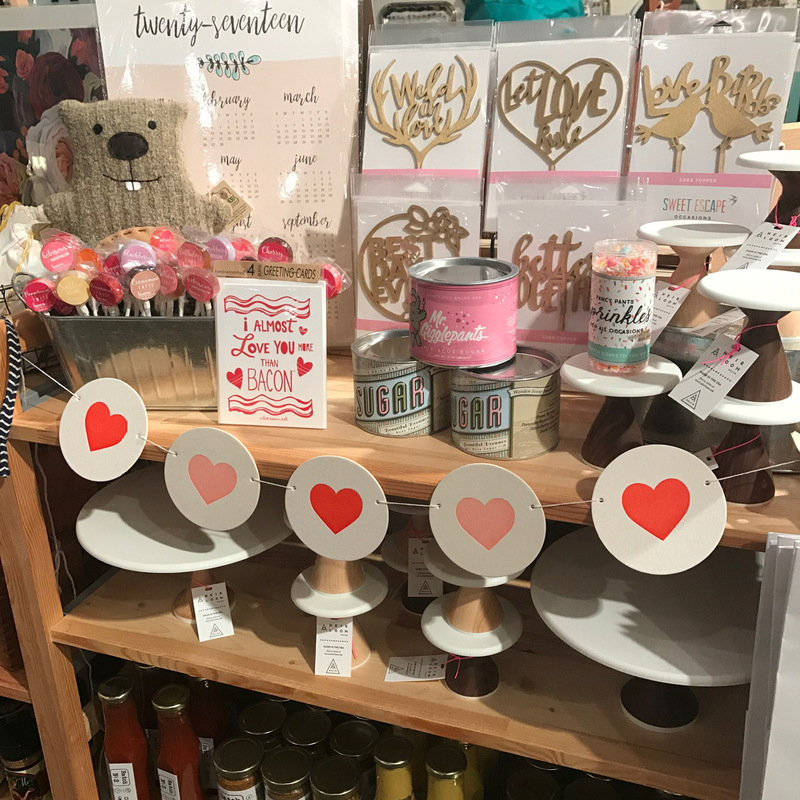 The Local Love Event: Saturday, February 11th: 11am-4pm: We’ve packed all the local love into one event, so you’ll have no trouble shopping for your sweetheart this Valentine’s Day. We’ll be featuring a jewelry bar with Salame Jewelry Designs where you can personalize the perfect pendant, earrings, or bracelet for your s.o., bouquet orders will be taken from Jacquelyn Nolen of Blue Flower Studios, and The Onyx Exchange will be mixing up your individiually chosen candle scents at another in-store candle bar. Jewelry, flowers, candles… what more could you ask for? Oh, how about 14% off all Homespun product on top of that! Workshop: Macrame Wall Hanging: Saturday, February 25th, 2-5pm: The textile art trend is sweeping the world of interior design, and that means macrame is back baby! Have you always wanted to learn? 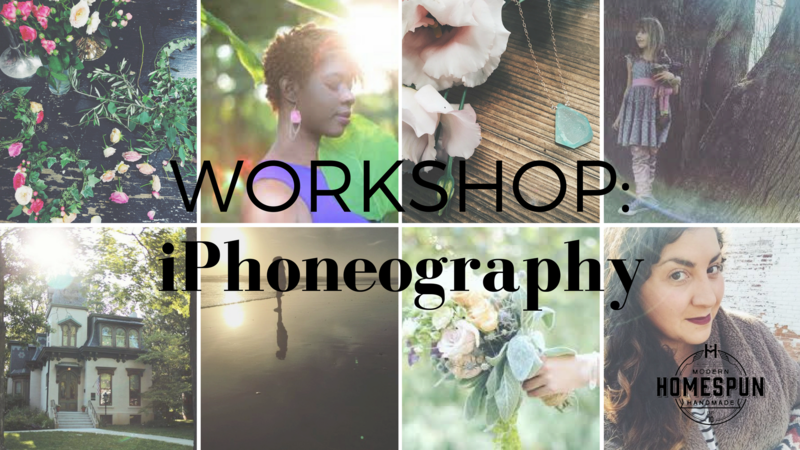 We have the perfect class for you! 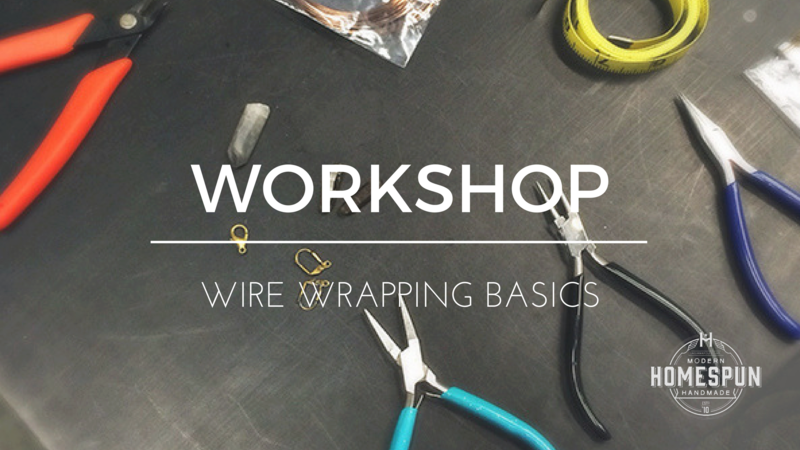 Savannah Norris, local stylist, artist, and Jane of all trades, will help you craft a macrame wall hanging during this workshop. All supplies are included – you’ll just need to bring yourself and your crafty spirit! 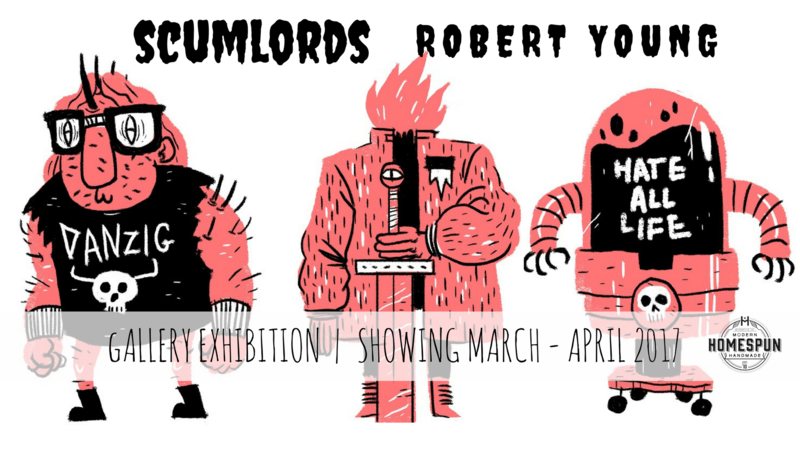 First Friday Gallery Exhibition ft. Robert Young: Friday, March 3rd: 6-9pm: Join us for IDADA’s First Friday Gallery Walk in-store celebrating the work of local illustrator and comic artist, Robert Young. Graduating with a BFA in Illustration from Herron School of Art & Design, Robert later earned his MFA in Illustration at The Maryland Institute College of Art. Currently an Illustration Professor back at Herron School of Art & Design, Robert has had work featured in Time Out New York, Until Now Magazine, The Classical.org, The Travel Channel, and more. Hey all! Its a slow, rainy week but we’ve got some sweet items to brighten your day. 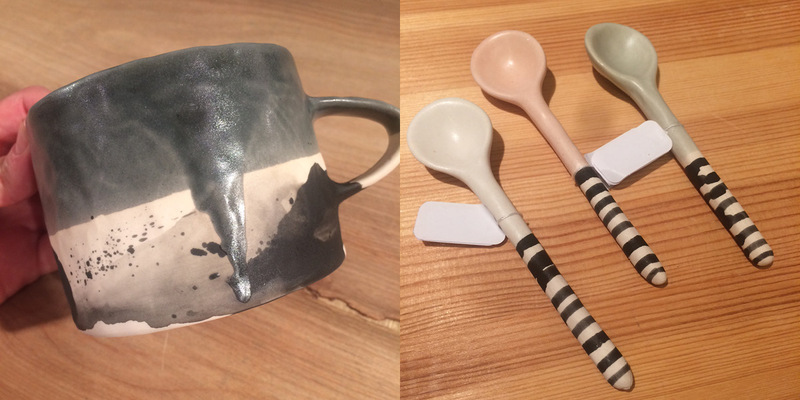 We’ve also got a couple new events coming up including one called Cocoa & Canvas (doesn’t that sound amazing?!). We’re feeling the love on our shelves this week! We have a HUGE selection of Valentine’s cards, and this one just jumped right out at me today. 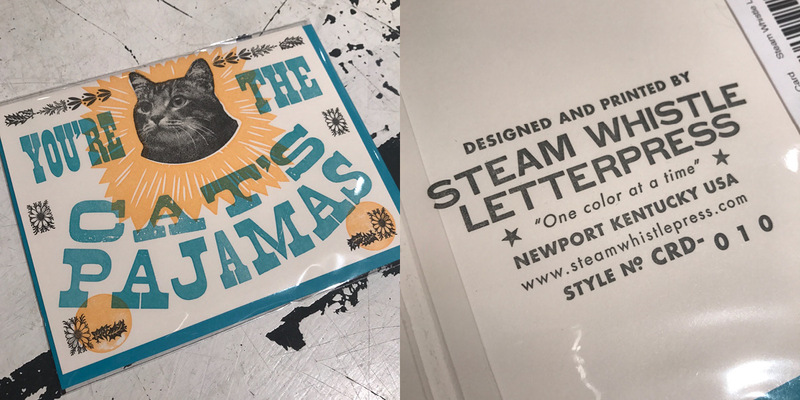 From Steam Whistle Letterpress. 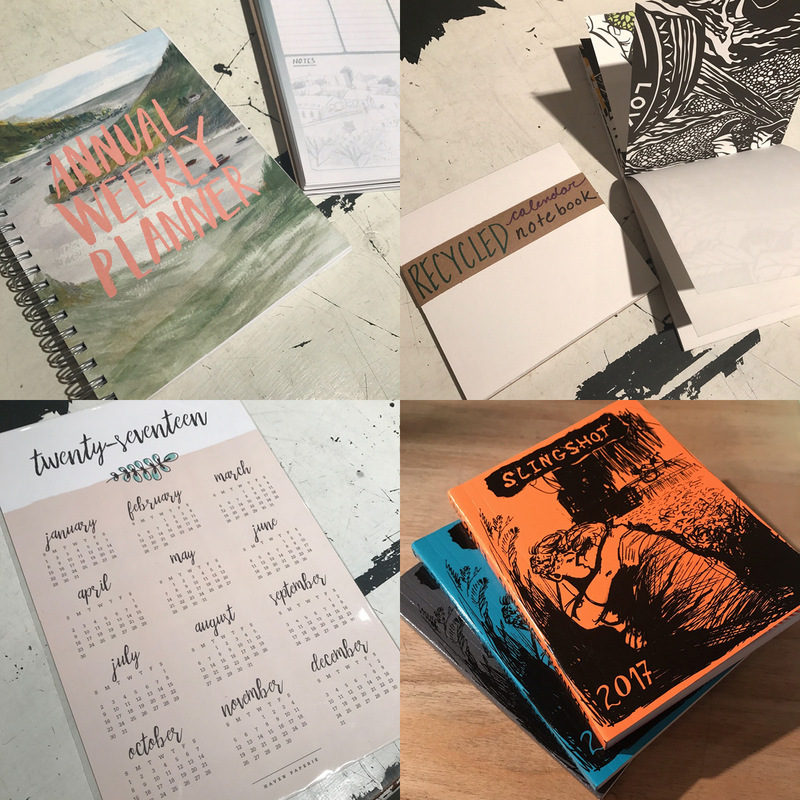 Get your organization on this year: Annual Weekly Planner from Little Otsu, Recycled Calendar Notebooks by Nikki McClure, Slingshot Organizer from Slingshot Collective, and wall calendar by Haven Paperie. What Did I Buy Today? 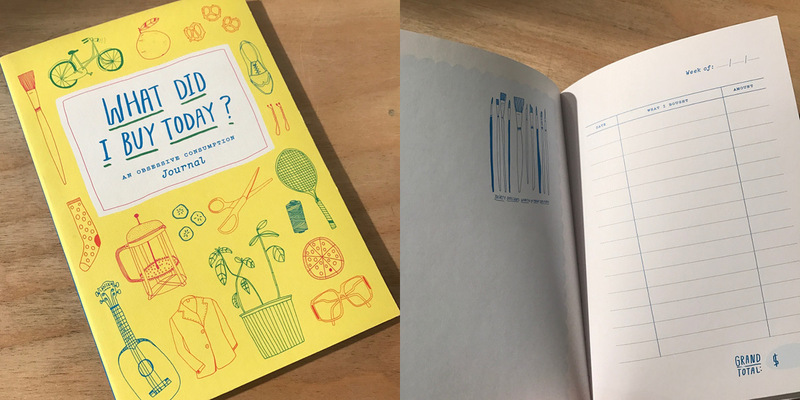 Journal by Kate Bingaman Burt. 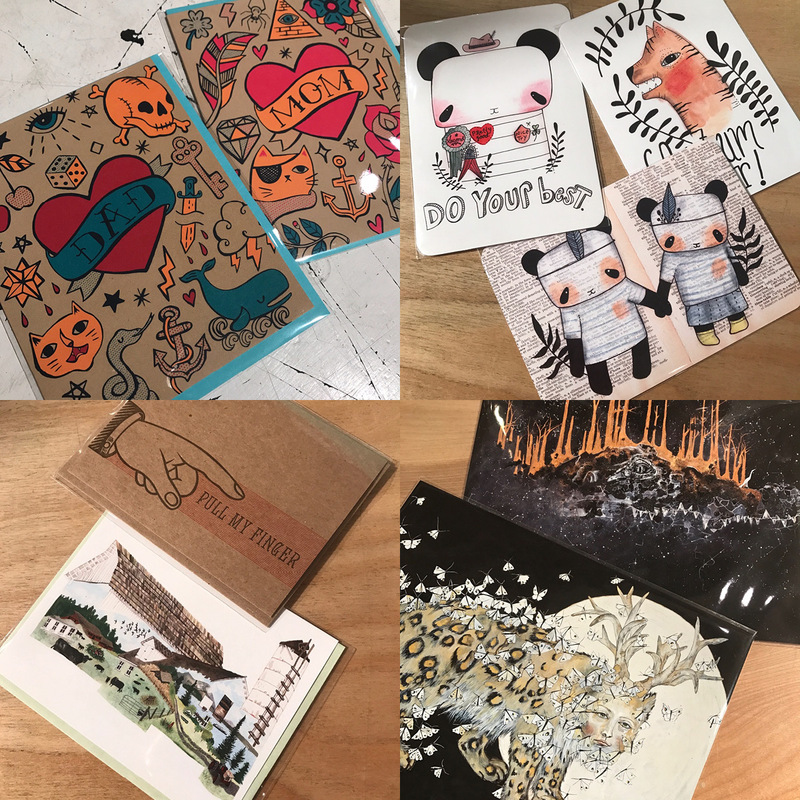 New cards and prints! Mom and Dad cards are by Allison Cole, sweet little pandie postcards by Trish Grantham, mysteriously alluring prints by Lela Shields, and cards by Power & Light Press and Jill Bliss. 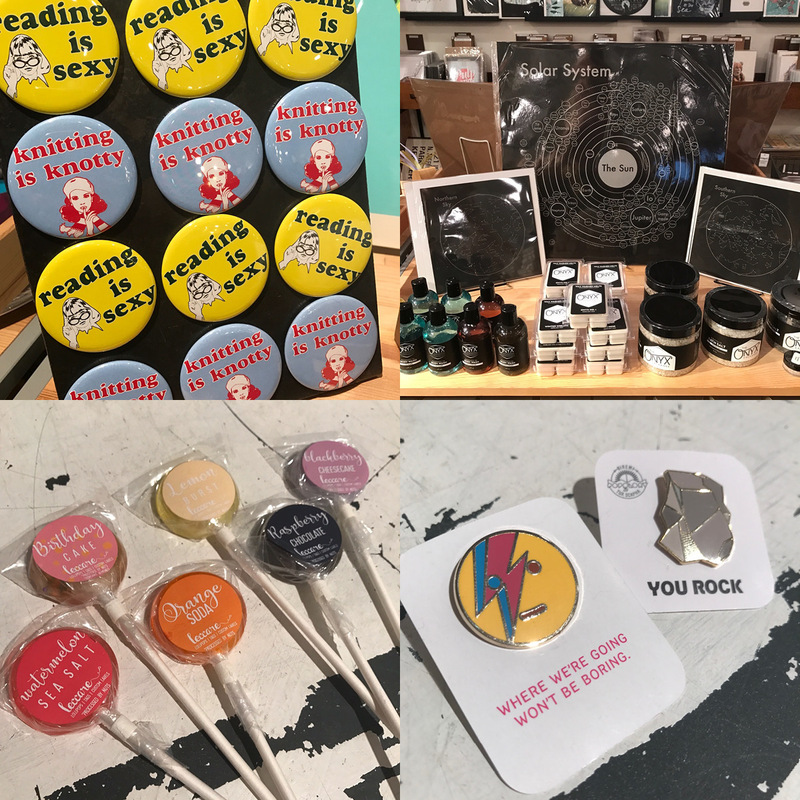 Restock on these ever popular magnets by Sarah Utter, new constellation prints by Archie’s Press, pins by Pop Glory, and delicious new suckers in a rainbow of flavors by Leccare. Brand new -almost- sold out show up from Erik Lundorf. 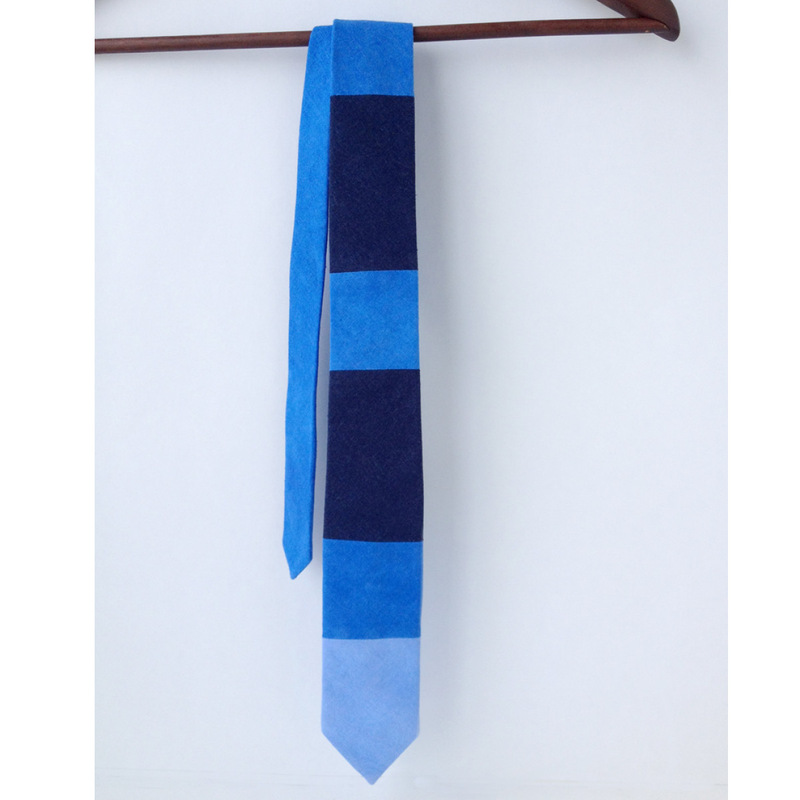 He’ll be bringing us a restock soon, make sure you come and check out this popular work! Thanks to our wonderful costumers, vendors and friends for a great holiday season and 2016. Make a resolution to buy ethically made, beautiful heirlooms that last. Buy better, not more! And let us help. 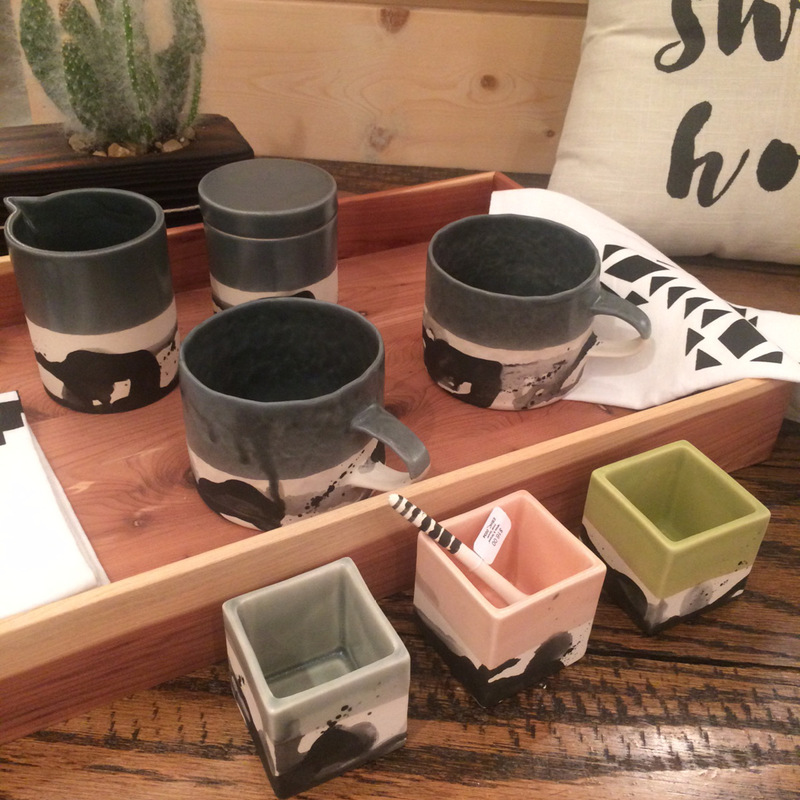 Beautiful new ceramics by Elizabeth Benotti Handmade Ceramics. 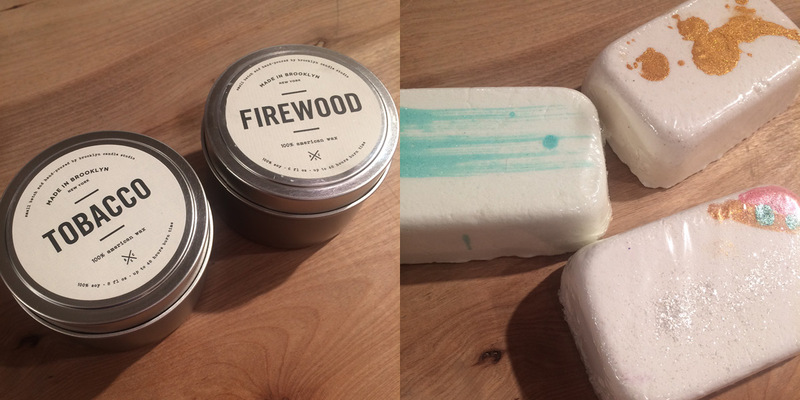 We just got these new “man” scents (MANdles, if you will) from Brooklyn Candle Studio. And these lovely little works of art on the right are bath bombs from Willow & Honey. 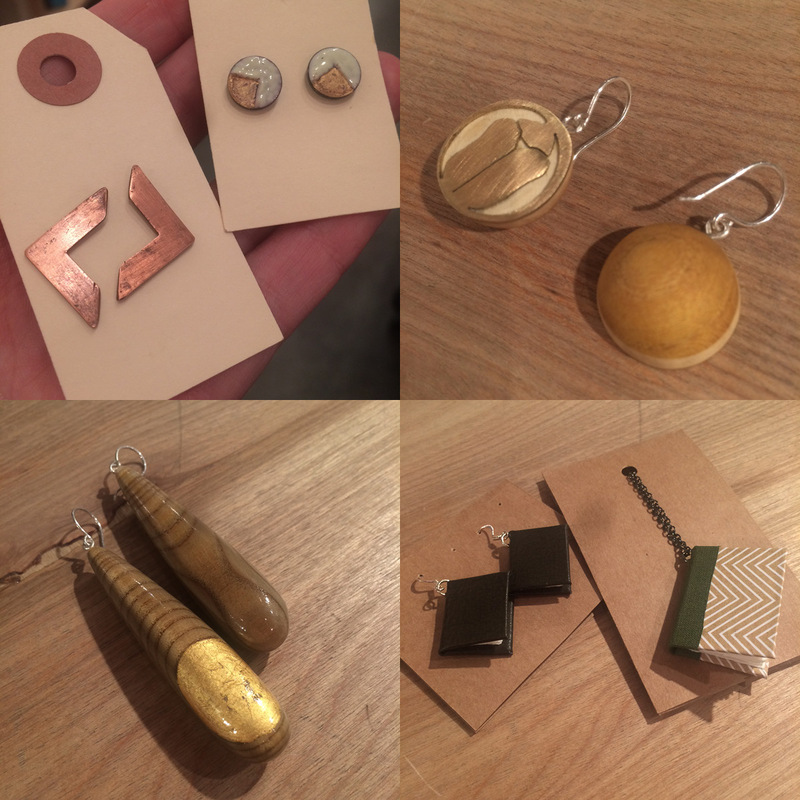 New geometric beauties from Courtney Fischer, metallics and woods combine to dazzle in these new pieces from Studio AMF, and little books- functional and stylish- from Ohmygolly Press. 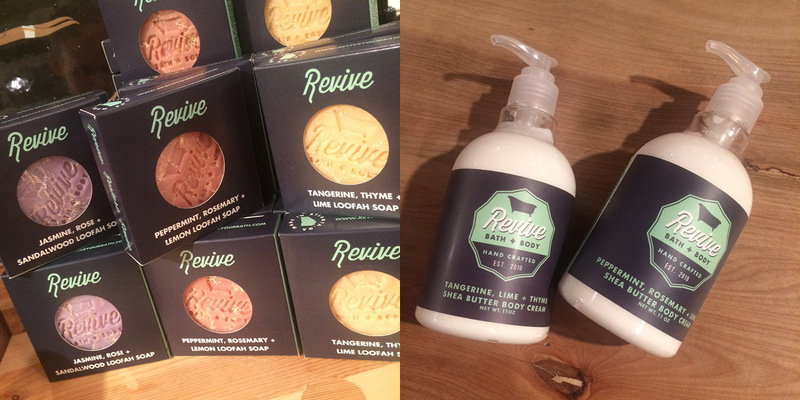 Brand new soaps and lotions from Revive Bath & Body. Help provide business training to women in developing nations with each purchase. 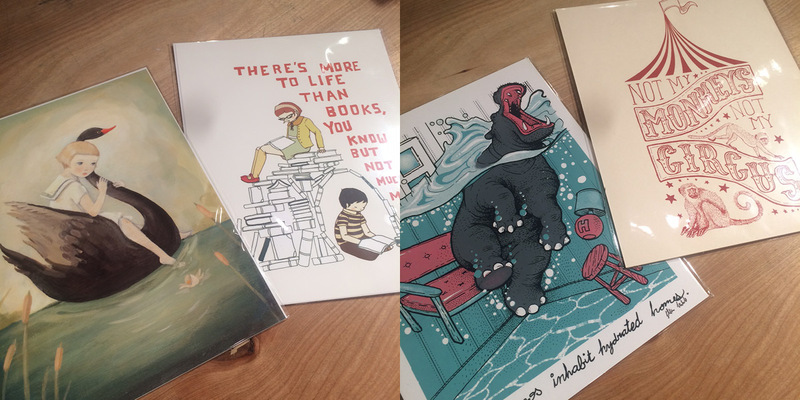 New prints from The Black Apple and Jillian Nickell. 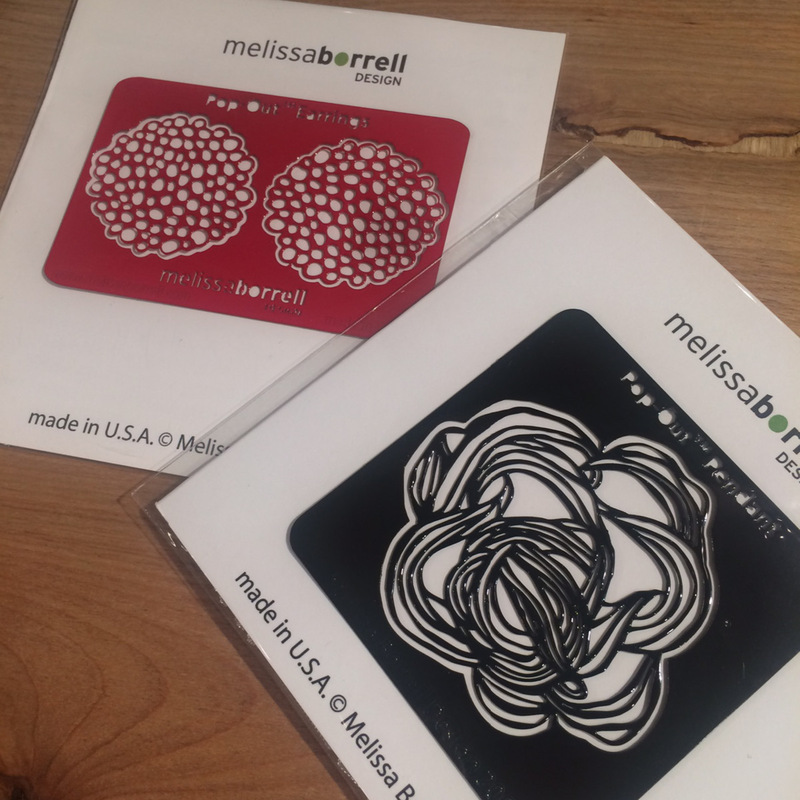 Pop-out earrings and pendants from Melissa Borrell Design are so unique and fun! Clasps and chain included. 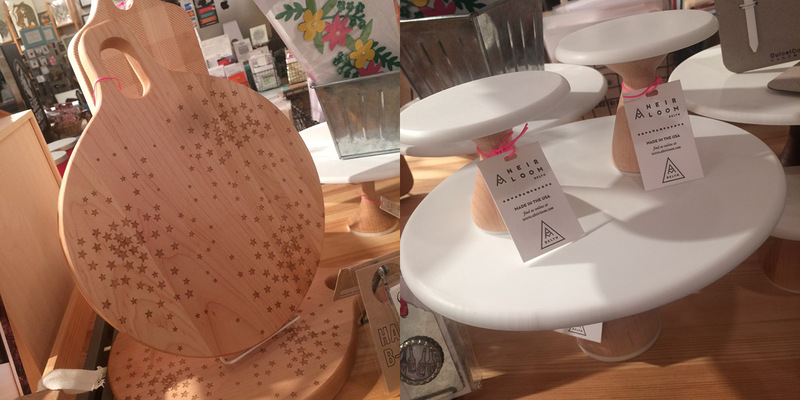 Brand new vendor American Heirloom brings these gorgeous cake stands and cutting boards, handmade in Brooklyn. New window is cozy and snowy. 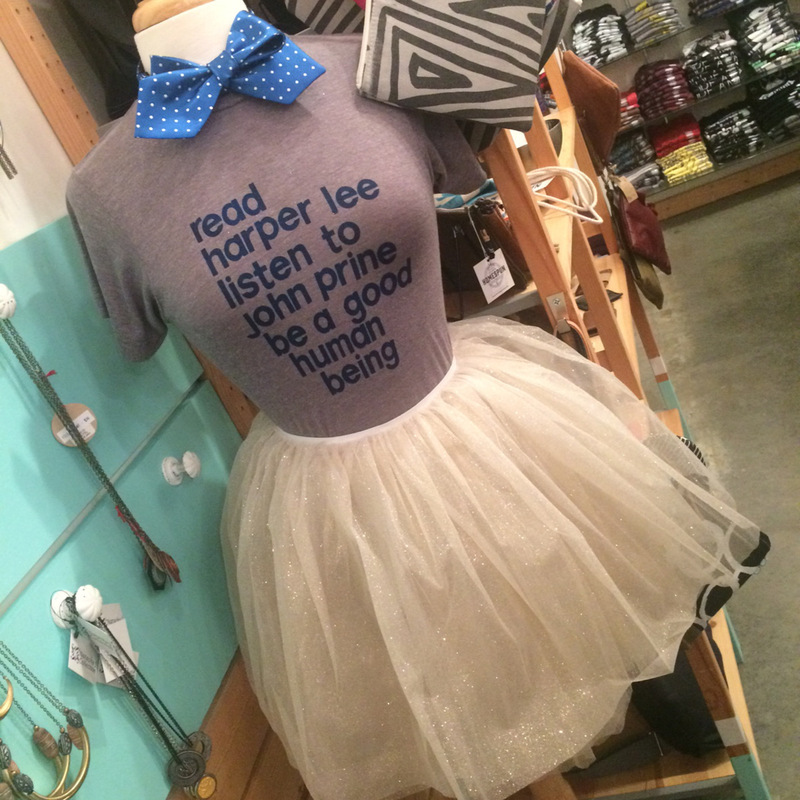 We are ready to party in this tee by Bad Knees Tees and bow tie by Rock My Bow Tie. 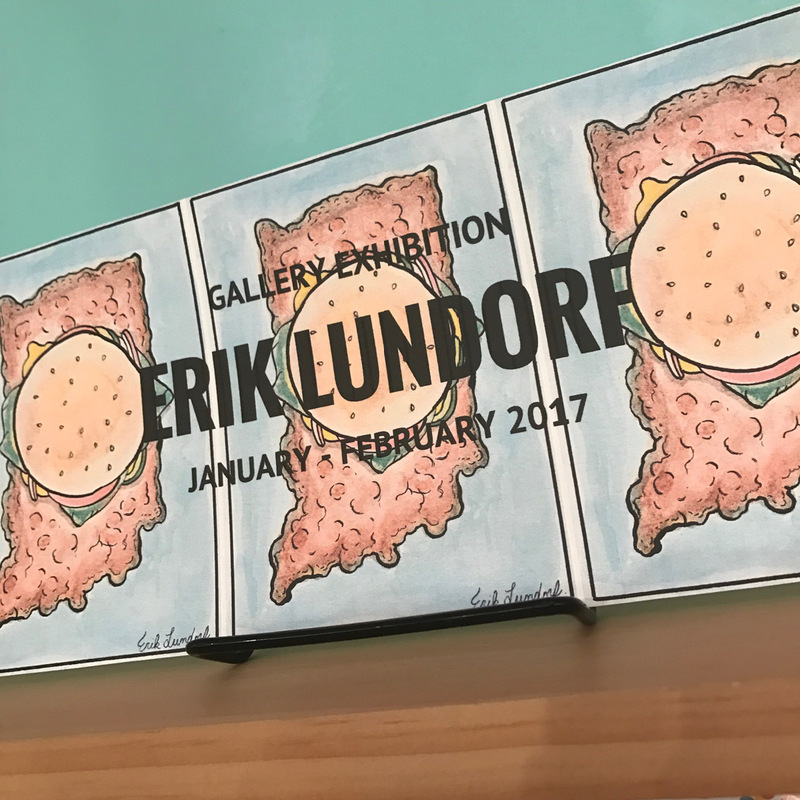 First Friday: Friday, January 5th: Erik Lundorf: 6-9pm: Join us for January’s First Friday Gallery Walk in store from 6pm – 9pm. 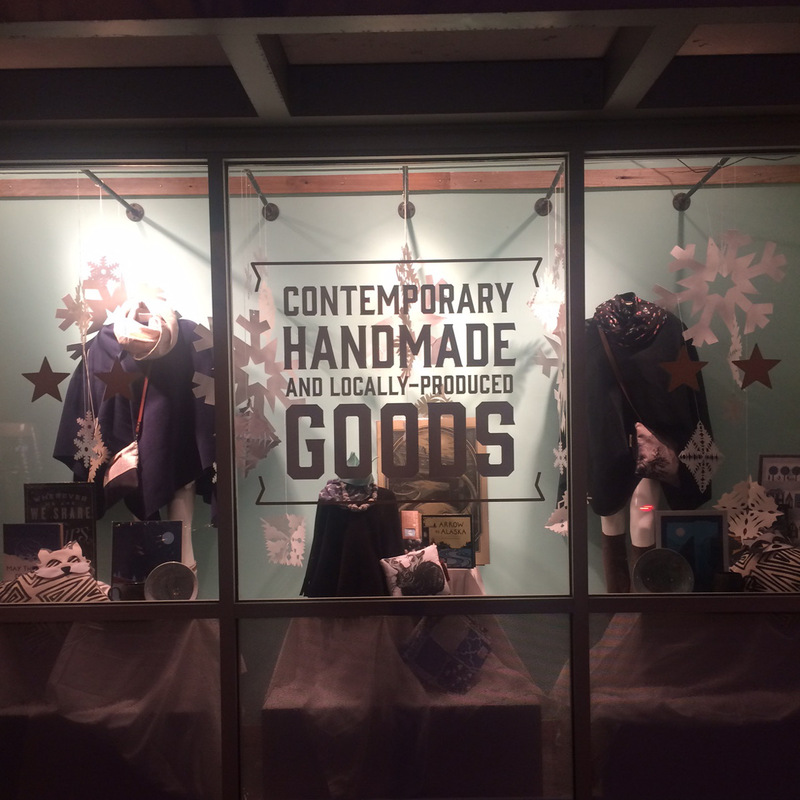 We’ll be featuring new work by local artist Erik Lundorf and we’ll have treats and libations to keep you warm! 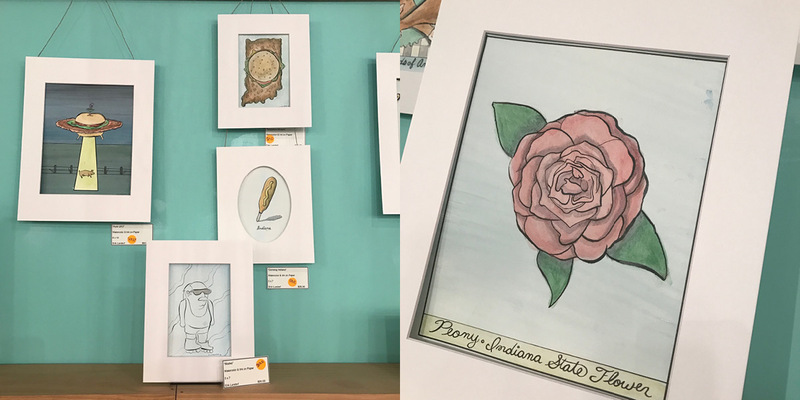 Erik has created a line of Indiana inspired illustrations just for his January – February gallery exhibition in our store. With a Studio Art concentration in oil painting, Erik graduated from DePauw University in Greencastle, IN and currently works on a wide range of projects from privately comissioned portraits and personal comic strips to commercial illustration and digital design. 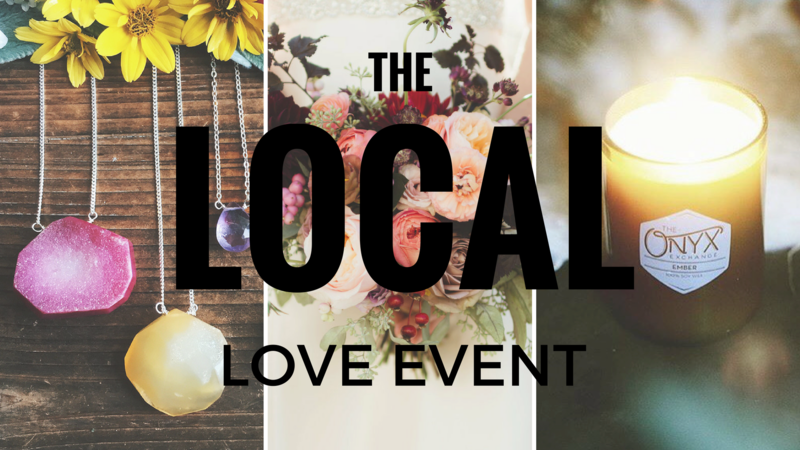 The Local Love Event: Saturday, February 11th: More info to come soon!